I’m happy to share this poster for my upcoming talk at UConn (in English). 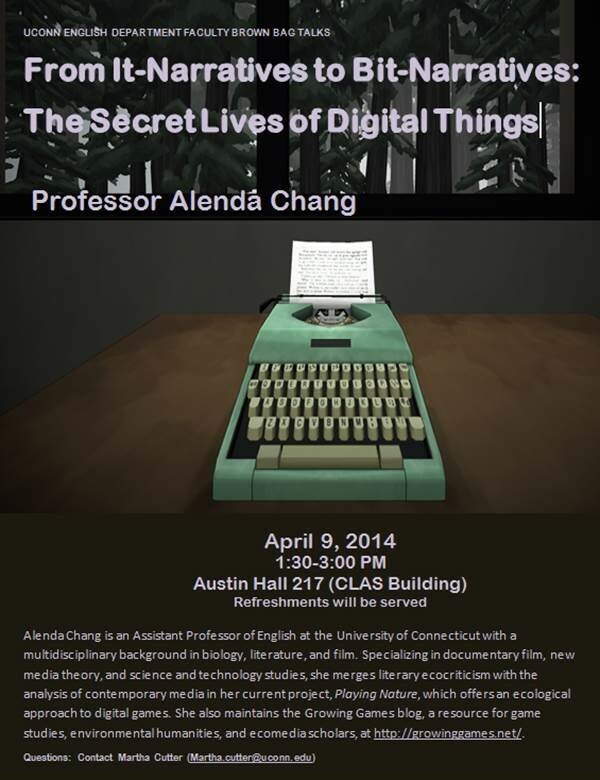 If you’re in the area, I will also be presenting on April 8th as part of UConn’s Digital Media and Design department’s new Digital Directions speaker series (part of a celebration of this year’s Day of DH). For those attending next week’s SCMS conference in Seattle, consider becoming part of the new Media and Environment Scholarly Interest Group (SIG). I’ll be on a Saturday morning Media and Sustainability panel, chaired by Nicole Starosielski and Janet Walker. Last but not least, I’ll also be speaking at Drew University on April 21st (running a workshop for English and environmental studies students, but the lecture is open to the public), and the University of Maine (Bangor) on September 24–more details forthcoming. Please distribute to those who might be interested! Thanks to the gracious powers that be, I am on leave this semester, but in the spring I’m offering one section of a gateway literary-theory course for English majors (skewing environmental), and one special-topics course on textuality (skewing new media). These will be some of the first courses to explicitly tackle “the digital” in a department better known for its strengths in medieval studies and children’s literature. I’m still dithering over what primary texts I want to use in each, though I’m leaning toward China Mieville’s The City and the City, Richard Powers’s The Echo Maker, or Geoff Ryman’s Air for 2600, and Vernor Vinge’s Rainbows End and Neal Stephenson’s The Diamond Age for 3623. Suggestions are welcome! I’m also slated to offer an “Intro to DH” grad seminar in Fall 2014, and as I come more from interdisciplinary new media studies than DH proper, I’m expecting to learn and experiment right alongside my students. I’ll post a tentative syllabus and a compilation of resources sometime in the new year. To prepare you for work in more advanced classes, this course will develop your understanding of the discipline of English through a select overview of literary history and the major theoretical schools of twentieth-century literary criticism—among them reader-response, New Criticism and close reading, structuralism and post-structuralism, new historicism, cultural studies, and postcolonial theory. As we will discover, these are not simply theories for theory’s sake, but rather diverse perspectives on what should be included in (or excluded from) the literary canon, the relative importance of genre, author, and audience, and the relationship of literature to broader social and cultural contexts. You should end the semester with a surer sense of the pleasures and pitfalls of different critical approaches to texts, as well as the many subfields and interdisciplinary extensions that “English” encompasses. In addition to a focus on textual interpretation, this course will also stress research and documentation guidelines and strategies, with special emphasis on changes in the discipline due to digital trends. You will learn, for instance, how to follow Modern Language Association (MLA) citation practice, how to evaluate both print and online sources, and how to make appropriate use of secondary sources while developing an original thesis. Assignments will include several short written responses and a final research paper with annotated bibliography. Since the dot-com boom of the late 1990s, a host of areas traditionally grounded in print literary culture—among them storytelling, argumentation, publication, and archiving—have been radically transformed by online and mobile devices and services. In this increasingly digitized postmillennial era, we might therefore wonder how literature and our study of it have been impacted and how to best argue for their continued relevance. Do shifting cultural and technological paradigms demand new texts and critical approaches, or are these seemingly dramatic changes just the latest variations in the ongoing evolution of the literary? To circle this question, we will consider not only the obvious crossover realms of electronic literature and interactive fiction, but also the application of literary methods and knowledge to non-literary objects. The course will frame the upstart arrivals of blogs, wikis, and e-readers within the centuries-old history of print, while revealing how deeply textual metaphors and practices continue to structure our online interactions. Throughout, we will also ponder whether “virtual reality” transcends any single genre or media category (for instance, video games), and discuss how form and format shape the development and experience of narrative. The term “digital humanities” now has an established foothold in our discipline, having generated lucrative funding opportunities from unexpected quarters and alternative academic (alt-ac) career paths for technically oriented scholars. Yet alongside the general enthusiasm, some have voiced a warning (witness the “Dark Side of DH” panel at last year’s MLA convention). So what exactly are the digital humanities? And why do they have a dark side? This course will serve as an introduction to this burgeoning subfield and its provocations, by exploring its origins in bibliographic and textual studies and literary archival projects, as well as more current initiatives involving gaming, “big data,” and cross-institutional collaboration. Special attention will be given to the challenges of studying and preserving literature now composed, distributed, and read in digital form. Students will not only have multiple opportunities to interact with active DH archives and platforms (Drupal, TEI, Project Bamboo, etc. ), but will also be asked to experiment with their own basic, but hands-on projects, preferably related to their existing areas of interest. No previous technical experience required. The first Flusser conference in the U.S. is taking place this weekend (11/1-11/3) here at the University of Connecticut in Storrs (schedule here). I’ll be livetweeting as @gamegrower as much as possible while I’m in attendance. Hooray! I’ve moved across the country, from one ocean-hugging state to another, to start my new job as an Assistant Professor of English at the University of Connecticut. In an uncanny fit for my current ecocritical work on video games, I’ve been hired to write and teach about both environmental literature and the digital humanities. Though I don’t consider myself a “digital humanist” in the narrow sense (an alternative academic or professor using digital tools and platforms to create online projects, often grant-funded, often archival in nature), I’m more than happy to carry that flag if it generates support for smart, open-minded, and ambitious collaborations across the usual disciplinary divides. UConn is in the midst of a considerable faculty hiring initiative, largely centered around the STEM-focused Next Generation Connecticut plan put forward by Governor Dannel Malloy and UConn President Susan Herbst. And while most of the hires are taking place in engineering, science, and related fields, a few of us literary folk slipped through under the auspices of terms like “DH” (see the English Department web site for information about the three other new DH hires: Bhakti Shringarpure, Yohei Igarashi, and Gregory Pierrot). Also up and coming are the new Digital Media and Design department, within the School of Fine Arts, and the Scholars’ Collaborative, named in honor of the Scholars’ Lab at University of Virginia. While things digital are just starting to gain bureaucratic momentum here, UConn just hosted THATCamp New England, this week we have ReMEDIAting Flusser, and I’m already teaming up with Anna Kijas and Tom Scheinfeldt to bring Joanna Swafford here in February to talk about her project, Songs of the Victorians. I also take comfort in UConn’s close proximity to New York City and Boston, both hubs for innovative media research and game design (if you’re in the area, take advantage of the Boston DH Consortium mailing list). Anything I should add to my new local lists? Let me know!